Key Stage 3 music, focuses upon performance, composition and appraising. Students learn to play a variety of instruments in solo and group performance settings. They compose music using both traditional techniques and with specialist software. They learn to analyse music by listening critically to a broad selection of music and express their thoughts using musical vocabulary. 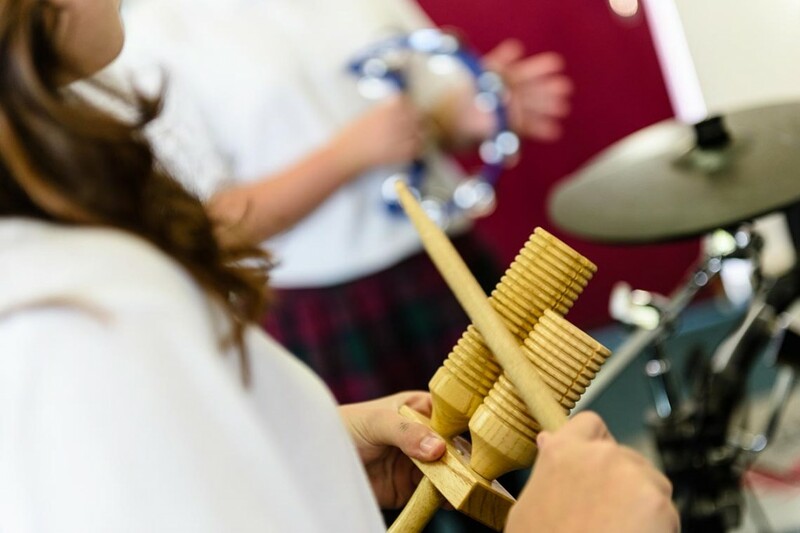 The unit is designed to engage students in whole class music making by providing a simple step by step approach that supports the development of instrumental skills on drums, guitar, bass, keyboard and ukulele, using music that students like, recognise and engage with. Homework: Students will have homework every other week and this will be related to the topics that they are studying. How to help: Students will be set homework to learn key words and may require help with this. You can encourage your child to describe the elements of music when you are listening to music and also practice their singing at home. Find Your Voice is a practical, hands-on, inclusive approach for engaging students with singing through vocal work and the integration of mobile technology. The approach looks at a range of teaching and learning strategies to engage all students with singing in the classroom and to help them feel confident about using their voices and mobile technology to create and explore music. How to help: Students will be set homework to learn the note values and note names and may require help with this. musictheory.net is a great website to help with this. Students compose their own piece using samples, mixing organ/orchestral and other sounds using a digital audio workstation [DAW] to become familiar with Bach’s iconic piece Toccata & Fugue in D Minor. They will engage in critical listening by comparing two versions of the piece before moving on to other classical works. How to help: Students will be asked to learn the key musical features of Samba and may require some help with this. The unit builds on previous work and further develops students instrumental skills on drums, guitar, bass, keyboard, ukulele and the voice, using music that students like, recognise and engage with. How to help: Students will be set homework to learn key words and may require help with this. musictheory.net is a useful website to help with rhythm values. Students investigate how music is used in films to create moods and enhance the viewing experience. They then compose their own piece of music for a short clip from a range of film genres. Their music is digitally merged with the film clip to create a profession end product. Homework: Students will have homework every other week and this will be related to the topic they are studying. How to help: It would be beneficial if students could be exposed to examples of Rock and Roll or music influenced by Rock and Roll, at home. Students first learn to play a piece of music within an ensemble. They then learn how to manipulate the musical elements to re-create the piece in a 1-Drop Reggae style. How to help: Students will be asked to explore different musical forms. BBC Bitesize and musictheory.net will support this. Students could evaluate the music used in adverts when they are watching the television. How to help: It would be beneficial if students could be exposed to examples of Reggae and Rap, or music influenced by these, at home. Students compose a piece of music in response to a given brief or set of stimuli. This unit explores the use of the musical elements and how they can be manipulated to create expression in music. How to help: Students will be asked to learn key words at home and they made need support with learning these. Students choose from a list of topics in which they can explore and develop their musical skills in a context that they find engaging. How to help: Students could evaluate the music used in films and on tv programmes in order to develop further understanding within this area. Performing Students will perform a solo piece to the class and will be marked using the GCSE criteria. Composition Students will complete two short compositions based on the Areas of Study. Listening and Appraising Students will study the set works from Area of Study 3. These are ‘All Blues’ by Miles Davis, ‘Grace’ by Jeff Buckley and ‘Why Does My Heart Feel So Bad’ by Moby. Students will complete a number of activities on each of the pieces, including a listening test and essay. Homework: Students will have homework every week and these will be based on listening and appraising or performance tasks. Apple Apps: Spotify for set works recordings, EarTraining/Trainer, Aural Trainer, Music Tutor, GarageBand. Performing Students will perform a solo piece to the class and will be marked using the GCSE criteria. They will also perform an ensemble piece which will be created with the other members of the class. Compostion Students will complete one short composition based on the Areas of Study. Listening and Appraising Students will study the set works from Area of Study 1. These are ‘And the Glory of the Lord’ by Handel, ‘Sonata in G’ by Mozart and ‘Raindrop Prelude’ by Chopin. Students will complete a number of activities on each of the pieces, including a listening test and essay. Composition Students will complete one short compositions based on Areas of Study 2. Listening and Appraising Students will study the set works from Area of Study 2. These are ‘Peripetie’ by Schoenberg, ‘Something’s Coming’ by Bernstein and ‘Electric Counterpoint’ by Reich. Students will complete a number of activities on each of the pieces, including a listening test and essay. Composition Students will complete their first controlled assessment during this term. The composition must be based on one of the Areas of Study. Students are allowed up to ten hours to complete their composition. It must be completed at school under supervision. Listening and Appraising Students will study the set works from Area of Study 4. These are ‘Skye Waulking Song’ by Capercaillie, ‘Rag Desh’ and ‘Yiri’ by Koko. Students will complete a number of activities on each of the pieces, including a listening test and essay. Students will also complete their mock exam during this term. Homework: Students will have homework every week and these will be based on listening and appraising or performance tasks. Students will also spend some of their homework time planning their composition controlled assessment. They will also be required to revise for their mocks. Performing This element will be completed by this point in the course. Composition This element will be completed by this point in the course. Listening and Appraising Students will complete a number of revision tasks. They will complete a number of exam style listening tests and part of the focus will be the extended answer. Students will also spend some of their homework time planning their composition controlled assessment.